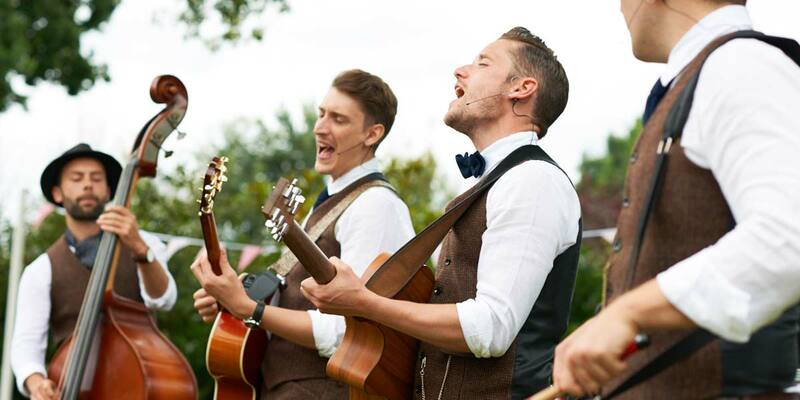 Put a smile on your guests' faces with one of our fabulous roaming acoustic bands, perfect for intimate occasions such as wedding drinks receptions, corporate champagne receptions, award ceremonies, after parties and more. Unlike our traditional acoustic duos who tend to set up their gear in one area of the venue, our mobile acoustic bands are free to roam from one location to the next, providing table to table entertainment and engaging your guests in a more interactive way. We have a wide roster of roving musicians, from contemporary and jazzy acoustic bands, to Mariachi bands and undercover singer waiters. Whether it's a lively mobile acoustic trio to get the party underway, or something more relaxed, our versatile walkabout acts will tailor their set lists to suit you and your event. Why not let one of our mobile acoustic acts lead your wedding party from one part of the venue to the next, creating a vibrant and memorable atmosphere that's sure to go down in history! Whilst most of our roaming acoustic bands for hire perform completely unplugged, we do also represent acts that are able to mic up to their PA system using wireless technology, the perfect solution for amplified roving entertainment.